In 1881 Master Painter, John Phillimore Smith, lived here with his wife and family. His wife Hannah was described in the 1881 census as a Groceress with one of their daughters, 25 year old Eunice, described as an assistant Groceress! John’s eldest daughter was employed as a servant in the home. John Smith died in the spring of 1891 and his wife the following year. The family continued living here until about 1910. In 1911 Mr William Newman, who had been trading as an ironmonger across the road since 1905, moved to these bigger premises and his name remains above the shop to the present day. William Newman was born in 1864, in Charlton Kings. He and his wife Annie lived in Haywards Road with their two children, Victor and Ivy. Their son Vic worked with his father in the shop. The hours were long, the shop opening at 8 am each day, closing at 7 pm Monday to Friday and 9pm on Saturdays. In 1918 William Newman died aged 54 and Vic continued the family business. 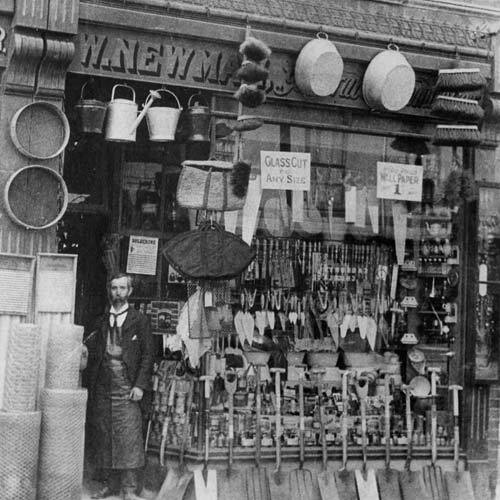 The ironmonger’s shop was always chock-a-block with all sorts of things. Nails, screws and almost everything small like that were stored in big bins behind the counter and weighed and sold by the pound. Other items were in drawers, large and small, again behind the wooden counter. 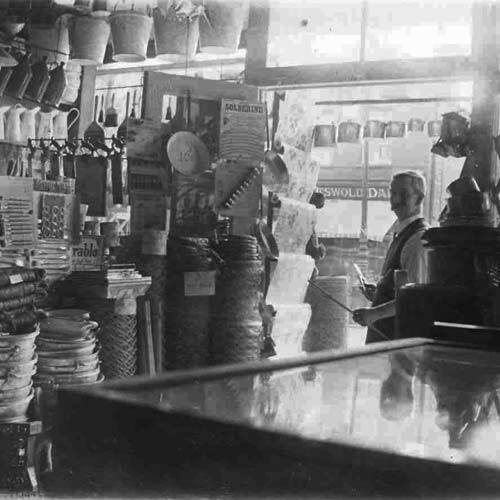 Putty was also sold by weight taken from large tubs and wrapped in newspaper. Wallpaper became more popular and replaced paint on the walls of even the smallest homes. It cost from one penny a roll and came with a selvedge of ½ inch either side to protect the edge. Trimming this selvedge was offered at ½ d a roll. The paper went into a special machine and with a turn of the handle the paper was trimmed in seconds. You could of course choose to save the half-penny and do the laborious job yourself. Like some shops today you could select your wallpaper from large sample books or from a fixture in the shop. The paper would then be ordered for you and would probably arrive quite quickly. 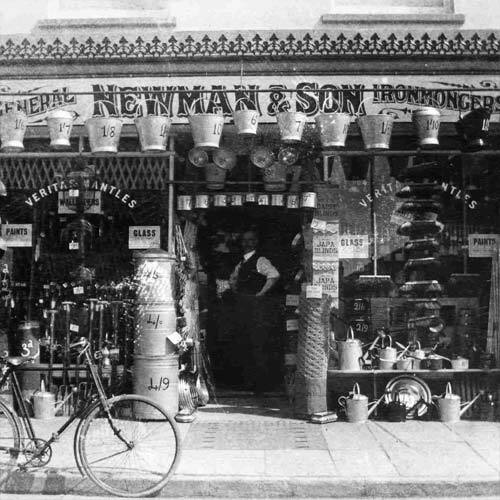 Two or three deliveries a day were made to the shop, the goods coming to Cheltenham by rail and then on to the shop by horse and cart and later by van. At the side of the shop was a private entrance (number 182) leading to the accommodation over the shop. 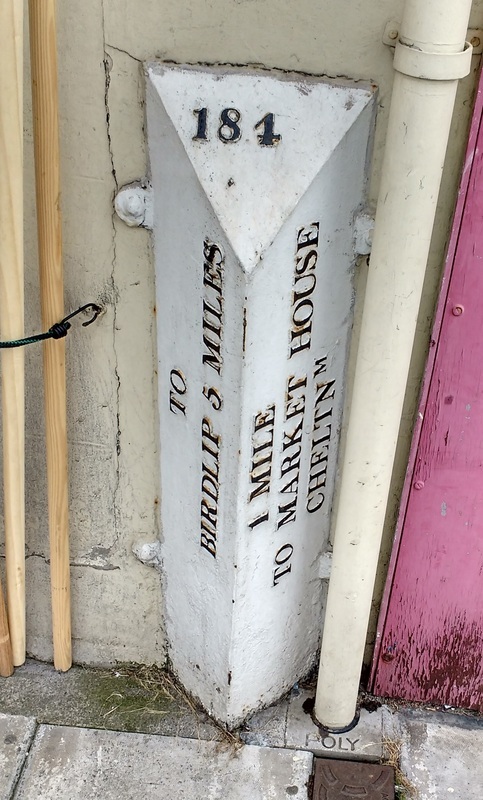 During the 1930s after the road was re-numbered the shop was enlarged by knocking the passageway into the shop and number 182 was lost! During the war when the men were called up for service the women worked in the shop, amongst them was Vic’s daughter, Doreen. Vic was part of the fire watch team set up by the traders to try to protect their businesses. When the sirens sounded the team on duty had to patrol their area to check for incendiary bombs. The night of 11/12 of December 1940 was not one of Mr Newman’s duty nights. However when it became clear that Cheltenham was in for a heavy night of bombing he decided to check his shop. Of course the contents of his shop would have made an enormous bonfire had a spark ignited it. He was checking out the cellar of the shop when an oast house (drying house) at the rear of the pub next door fell across the doorway to the cellar trapping him inside. He was fortunate to be able to scramble through a small opening to safety. Sadly, that night twenty-three people in Cheltenham lost their lives and 600 were made homeless. Vic continued in the business until he died in 1962. Doreen’s husband, known to many as Chubb, took over the running of the business helped by, amongst others, Mr Jim Butler and Mr Derek Brimfield who was later to become the landlord of the Brown Jug further along the Bath Road. 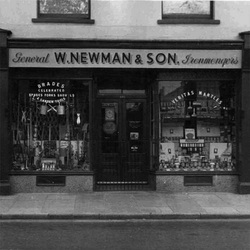 The business was bought by Mr H A Crawford in June 1980 and run by his sons Mike and Mark Crawford, who continued to trade under the name of Newman. 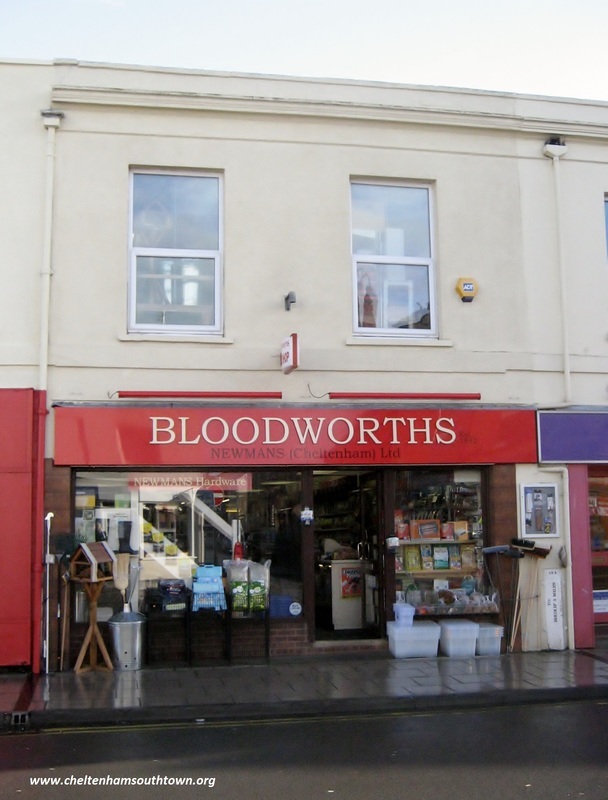 In January 1998 Bloodworths, also owned by the Crawfords, was transferred to 180 Bath Road to join Newmans and became Bloodworths and Newmans retaining two great retailing names in the Bath Road. 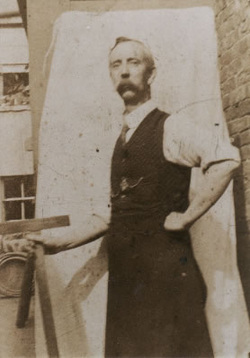 Photographs reproduced with kind permission of Newmans & Bloodworths. 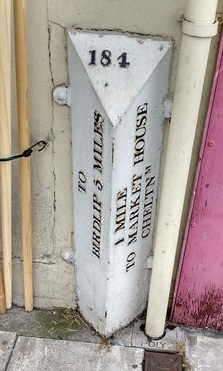 An old milestone showing the distance to the Market House, formerly in the High Street opposite Primark.